This article relates to the Northwest Native American Indians Totem Pole Symbols and Meanings. 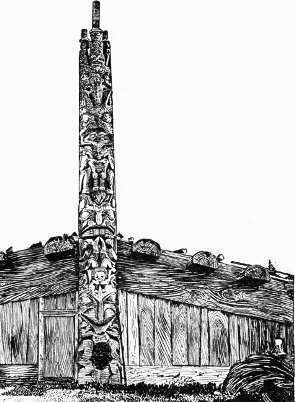 What do the graphic carvings and coloring depicted on the totem pole mean? A totem pole depicts emblems of animals and mythological creatures that are believed to have spiritual significance and who watch over the families, clans, or tribes who adhere to the belief of Totemism. The Totem Pole symbolizes guardian spirits or helpers each of the animals, images and symbols have special and specific meanings. For additional information refer to Power Animals. 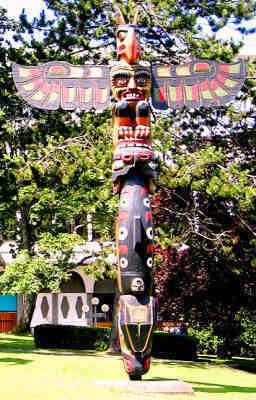 Tribes of Northwest Indians carve and construct the Totem Pole include the Haida, Tlingit, Bella Coola, Tsimshian, Kwakiutl and the West Coast tribe. Men and Women are represented fairly realistically. People can be depicted upright but more often in a crouching position. People are shown with erect ears and women are distinguished from men by a labret (lip ornament) in their lower lip. The eyes of land animals are carved as two curves enclosing a circle. Four legged animals are usually depicted in a crouching position. The bodies of most animals are facing the front. Birds are usually carved perched with their wings outstretched or folded at their sides. Their legs have large, clawed feet. Beaks horizontally protrude from the figure or carved tucked against the chest. All birds have eyebrows and have ears on the top of their heads. The Killer Whale has two spines above the round eyes, two prominent dorsal fins, a large head and a mouth turned up at the corners. Often has spots painted on its back. The Frog is portrayed as if seen from above. The Mawdzeks, another mythical bird, resembling an eagle, with a short beak turned down and depicted with his wing wrapped in front of him. The Sisiutl is a scaly double-headed serpent. The Sisiutl is another crest of the Kwakiutl tribe and has magical powers to transform into many forms representing both good and evil. It is a snake like horizontal figure depicted with a profile head, teeth and a large curled tongue at each end of the serpent. In the middle of its body is a human head with horns. The Dzunukwa is a grotesque female giant and always painted with black. She is depicted with deep eye sockets, half closed eyes, pursed lips and pendulous breasts.